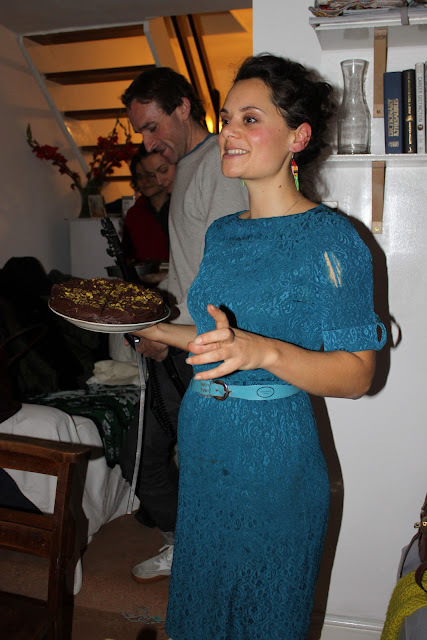 Dinner Exchange is an ethical food project started by Alice Planel, a French woman brought up in England. 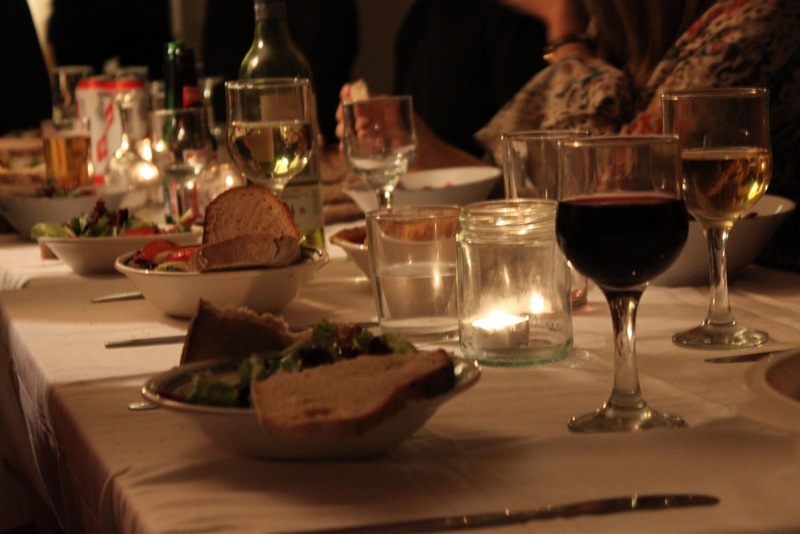 This supper club uses food donated by New Covent Garden Market vegetable stalls, mostly organic, and asks guests to give a donation in return for their dinner. This falls in with a tradition amongst food activists of ‘skipping’ food chucked away by supermarkets. When I was squatting in the London Fields Lido a few years ago, almost all the food was obtained from bins. It might sound disgusting, but the food was still intact, often packaged, sometimes we found unopened champagne and chocolates. The best source was Lidl: unlike the top supermarkets, they didn’t deliberately ruin the food in their bins with washing up liquid. 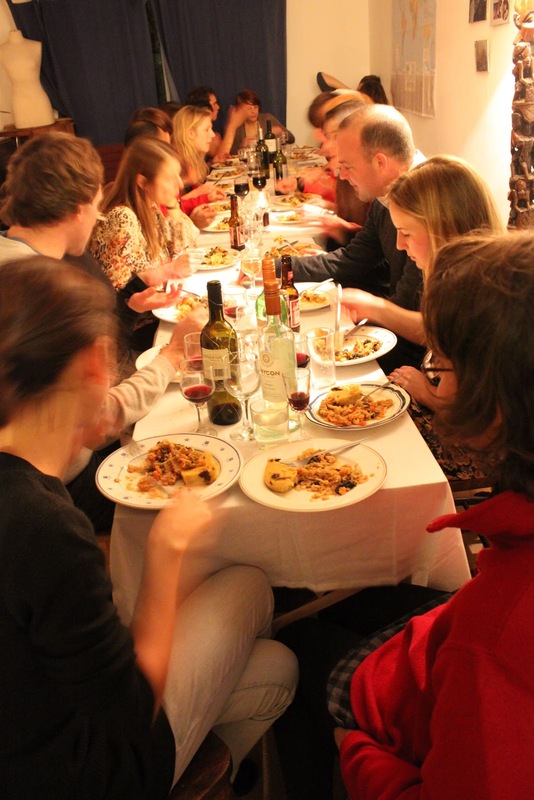 Friday night, the Dinner Exchange was held at Alice’s house near Willesden Junction. 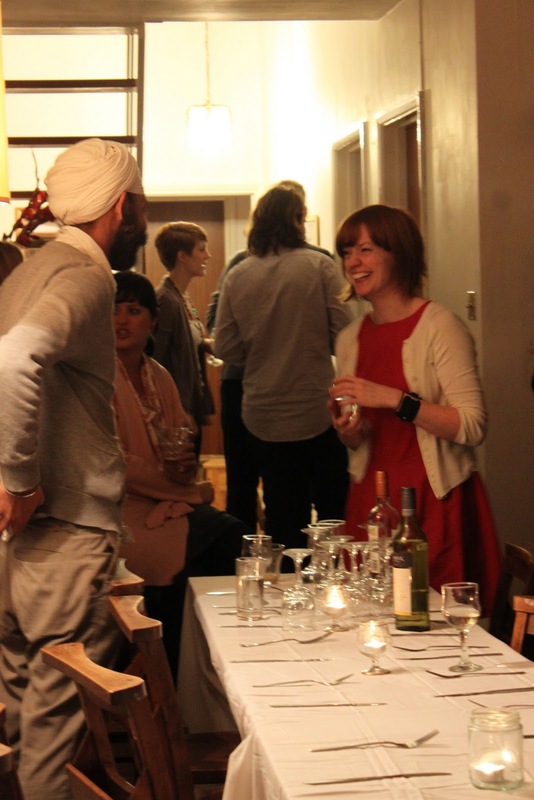 Around 25 guests were seated along a long table, around half the table were journalists from East London. I sat next to a young architect, wearing a tailored coat and a neat traditionally wrapped turban. We exhausted my knowledge of Sikhs ‘What do you think of those weird white Sikhs in America?’ and of architecture. I photographed Nigel Coates and Zaha Hadid many years ago for a magazine. Nigel had the most seductive voice, you fell in love with him instantly but of course he’s gay. Zaha Hadid is the highest profile female architect in the world. This young man, Germeet, likes minimalism and modernism in architecture. I told him I had visited Le Corbusier buildings in Chandigarh which led onto… why I went there in the first place. I was planning a trip to India and interested in photographing something a bit edgy, I had fantasies about being the female Don McCullin, a war photographer. A reporter gave me some contacts in Southall. I spent a few days strolling around Southall with Sikh guys, learning about their religion, going to the temple and having some very delicious curries at various restaurants (food was always a focus even before I became a food writer). The plan was for me to go to Amritsar, a town shut off to foreigners at the time, meet up with some of their people and photograph a training camp for Sikh revolutionaries over the border, in the Pakistani desert. “Won’t I stand out?” I asked. At this time I had a blond bob. “Then there will be no problem, you will look exactly like a Punjabi girl”. He reassured me, shrugging. A few weeks later, I’m in a hotel room in Chandigarh dying my hair brown. I’d bought a long brown plait and salwar kameez. I sprayed my face and hands with instant tan. I looked in the mirror “Not bad” I thought approvingly. I rose early in the grey dawn and took a rickshaw to the bus station where I bought a bus ticket to Amritsar. The ticket seller looked at me oddly but relented and sold me one. On the bus I was dismayed when an Indian army officer sat next to me. I decided to pretend to be asleep. Every time I stirred, he leant close to me and tried to talk. I carried on dozing. The bus trip took five or six hours. Then we were on the outskirts of Amritsar, I had no choice but to ‘wake up’. I leafed through it, looking up hostels in Amritsar. “Where are you staying?” asked the Indian soldier. “Er, here!” I pointed to a hostel. The bus stopped and I walked quickly, trying to shake off the Indian officer, to the first hostel address in my book. Once there, I had to pass through a barrier, it was surrounded by soldiers in fatigues. I went up to the reception desk and asked if I could have a room. The ‘receptionist’ stared at me and said “This is an army barracks, you cannot stay here”. I left quickly and, a little embarrassed but still optimistic, went to several other hostels and hotels. “Do you have permission to be here?” asked one. “Um, er, where can I stay do you think?” I avoided answering. By this time I’d amassed quite a crowd, all interested to see who and why this English girl was a)wearing an unconvincing hairpiece and fake tan b) dressed up as a Punjabi girl c) what the hell was she doing in Amritsar which was off limits to tourists ever since a bunch of Sikhs had assassinated Indira Gandhi there. In India there is often a hotel at the train station, I thought I’d try my luck there. By now a huge crowd had built up. I was hemmed in. They looked angry. Orange Turban Guy grabbed hold of my arm and marched me to a room. “Is there a hotel here?” I stammered, a little bit frightened now. “YOU MUST LEAVE. YOU ARE ARRESTED.” He shouted. I waited in the room for a few hours. I was given food, actually a very nice tray of tasty vegetable curries, dahl and rice with a few curried pickles on the side. Finally Orange Turban Guy returned and pushed me out to the platform. A train chuffed into the station. It was bulging with people. I found myself being physically pushed onto the train. There was literally no room, I didn’t know where the train was going. It didn’t look possible to have even one more person, but I somehow found a tiny space. The train doors were shut and we were off. My war photography career was over. Many hours later I ended up in Varanasi where, overcome by the ashes of the dead, the harassment by strange men and the whole weird vibe there, I had a mini breakdown which I successfully combated with banana lassis and toasties. But that’s another story. As is when I got arrested and offloaded from my plane at Delhi airport on my return journey because the Indian and British secret service had been following me since Southall. Starters: a roasted carrot and chickpea hummus with a salad. Mains: prune polenta and a kale veg stir fry. Dessert: a flourless chocolate courgette cake with pistachios. What a wonderful event to read about! I'm interning for FoodCycle at the moment and I knew Alice had recently joined us but I wasn't aware of her supper club or that the proceeds went to FoodCycle! 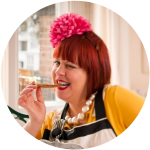 It is so great to hear about others working to combat the ridiculous levels of food waste we have in this country, and a big thank you must go to Alice and to everyone who attended for donating; and to you for posting about it of course. Think I'll have to get my name down for a future Dinner Exchange evening. Interesting to read about your attempt at being a war photographer too, you've lived such an incredibly varied life! I suppose war photography's loss is the underground food scene's gain though. Yes i feel that Alice's supper club goes back to the political roots of the underground food scene. You never know, I may get another bash at being a war photographer once the teen has flown the coop. I do hope you'll publish your autobiography one day – I'm sure it would sell like hot Marmite cup cakes. Great itiative to highlight how obscene food waste is. What a fab story- shame about the lack of Punjabi, you might have got away with it otherwise! But I think India was a bit mental then, so well done on just being shoved on a train rather than something worse. I too am looking forward to the Ms ML autobiog. thanks for your comments. I was terribly naive. Imagine how behaviour like that would be treated nowadays? Er: 'As is when I got arrested and offloaded from my plane at Delhi airport on my return journey because the Indian and British secret service had been following me since Southall.' Please do tell more?! What a crazy story – I think I'd have fallen apart too at the end of it all! Wow…. And may I ask – do you know why top supermarkets ruin their food? Does anyone ever question this? Surely it is morally wrong? !